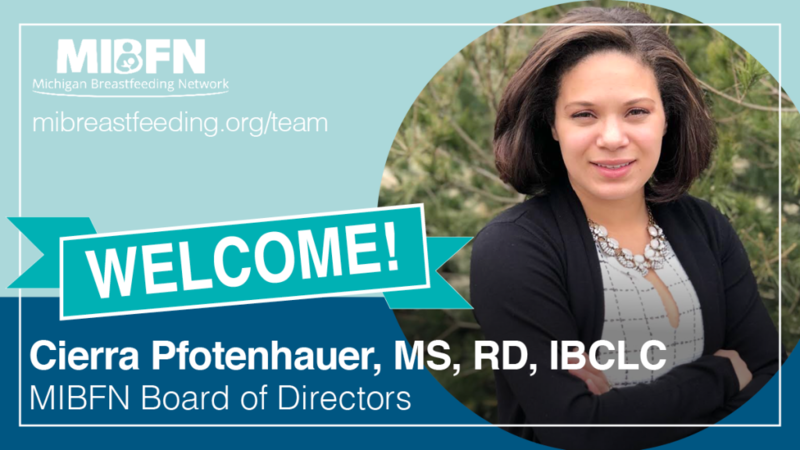 MIBFN proudly announces three new board members who began serving on our Board of Directors effective March 26, 2019. These new members, Kristine Maki, Bethany Moody and Cierra Pfotenhauer join twelve other board members whose role is to provide strategic guidance to our work. 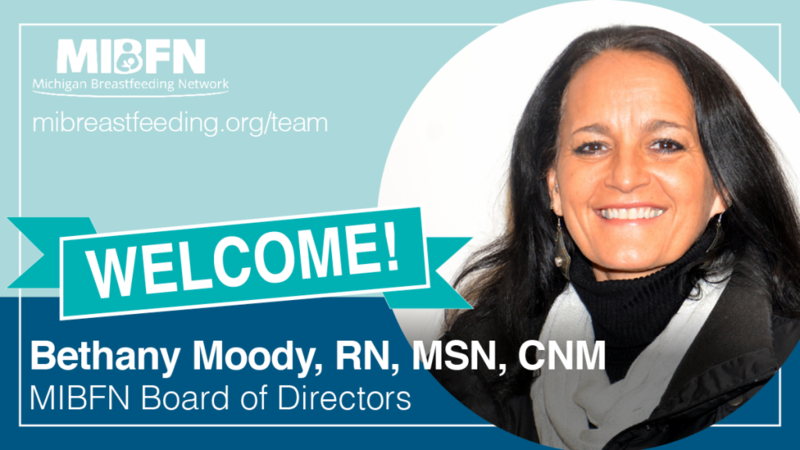 To learn more about the MIBFN Board of Directors, visit www.mibreastfeeding.org/team. Kristine M. Maki, BS, CPST: Kristine is a Family Health Educator and an Ojibwe member of the Keweenaw Bay Indian Community. As a student social worker working on her IMH-E, parent-child attachments are an important focus. She has worked in community health for five years and hopes breastfeeding will become the norm again not only for her indigenous community but for all families. 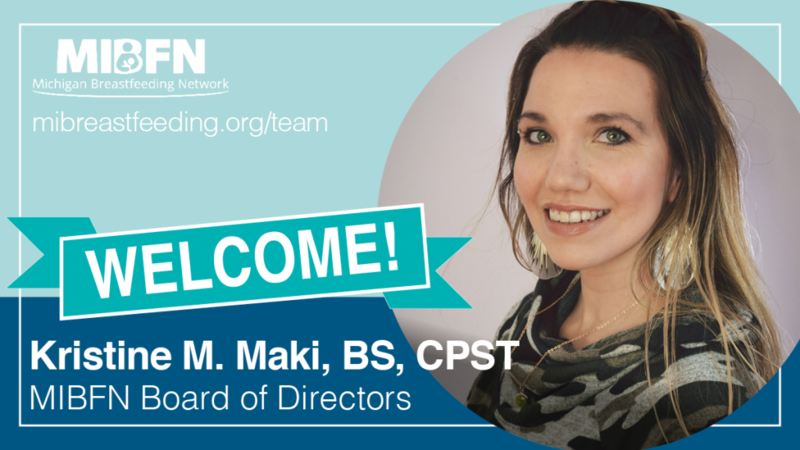 Breastfeeding has always played an important role in her life and she is excited to be a part of MIBFN to help with system change and the continuation of the normalization of breastfeeding. She has four sons at home in a supportive partnership and is currently breastfeeding her youngest who is seven months old. To build breastfeeding support within her local community, and with the help of the WIC Program, Kristine began a local Breastfeeding Support Circle with monthly face-to-face gatherings in hopes to create local breastfeeding support policies. Kristine’s other interests include crafting of any kind, quilting, outdoor activities, and the occasional video game with a chai latte. Cierra Pfotenhauer, MS, RD, IBCLC: Cierra’s passion for breastfeeding was born from her work with the WIC program. Her desire to support breastfeeding mothers inspired her to become an IBCLC. She is passionate about eliminating barriers to breastfeeding, particularly for mothers of color. She is an active member in the Berrien County Breastfeeding Coalition. She is a wife and mother to a son who she is currently breastfeeding. In her spare, time Cierra enjoys food and travel.